Spoiler Warning For all 7 books, considering that I talk about how this one relates to the story as a whole. In some ways, it’s weird that this is my least favourite of the Harry Potter books, because it introduces so many concepts that I find crucial to the overall series. (It also introduces so many things that come back in Books 6 and 7, but that’s entirely another matter). 1) Purebloodism. The whole ethos behind the Dark Lord’s rise to power first gets introduced here (previously it was just slated as a lust for power, with the vague notion that “some families are better than others”). We learn about Mudbloods and Squibs, about pureblood prejudice, about various feelings on interbreeding with Muggles. 2) House-elves. I don’t know how others feel about them, but Dobby was annoying and dangerous to me from the very beginning, and I don’t quite get the warm fuzzies that others have for him. I have no patience with characters who, while well-intentioned, are pretty much just screw-ups who get in the way and who never learn from error (same reason I dislike Hagrid so strongly), so Dobby grates on my nerves real fast. Regardless — what with Kreacher and Winky and all, house-elves become quite important characters in later books, and we first learn about them, and their special brand of magic, here. 3) School rivalries still affecting adult relationships. We get a little bit of this in Book 1 with Snape hating Harry because of James, and we’ll see far more of it in Book 3, but we start seeing more of it here. The scuffle between Arthur and Lucius in Flourish & Blotts is a particularly entertaining example. 4) Founders. Again, mentioned in Book 1, but we get a much deeper look here, particularly at the personalities, the friendships, and the betrayals. I believe this is the first time we get their first names? We learn a little more about what went into putting Hogwarts together, and what could go into tearing it apart at the seams. I have a special fondness for Founders-backstory, and I wish that we got even more of it than we do, but I like the introduction to it here. 5) Many other details. Small things, one-off topics, far too numerous for me to recount here. If I’d been thinking properly, I’d have kept a list while I was reading. But… the Whomping Willow. The opal necklace in Borgin & Burke’s. Expelliarmus. Polyjuice Potion. Basilisk venom. Godric’s sword. All of these things that come up, that become so critical (but many of which don’t come back until Books 6 or 7), first appear in CoS.
6) The most ultimately important of all of those seeds? The idea of Harry as a Horcrux, even though we won’t read that word for another four books. This early on, we learn (through the Parselmouth revelation) that Voldemort left something of him self behind, in Harry, unintentionally. We don’t know what this means yet. I daresay most of us shrugged it off at first, thinking, “Oh, yeah, sure, that must happen with powerful curses.” We didn’t know it mean Harry actually had a piece of Voldemort’s soul. And yet… I still just can’t get on board with this book. I wish I could put my finger on why. I think it may be that it suffers from some of the same problems as Sorcerer’s Stone — very linear plot, unsophisticated style, fairy-tale feel, lack of psychological depth — but it doesn’t have that shiny new series smell as the first book. There’s not the same adrenaline rush of exploring a new world to cover up for those flaws. And Rowling does re-use some of the same plot elements, which she’s better about nuancing in the later books. Still, good is good, and even the worst book in the series is still a four-star book by my reckoning. And for what it’s worth, after finishing this re-read, I was so eager to get on to the next one that I broke my rule about alternating reading projects and went straight on to Prisoner of Azkaban. 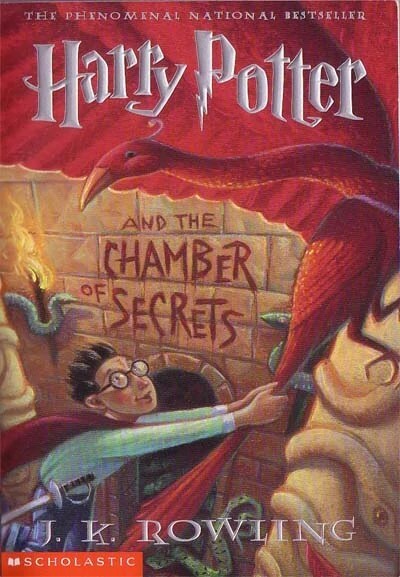 Chamber of Secrets is also one of my lesser favorites in the series, for much of the reasons you list. Even though there are so many crucial ideas and plot points introduced, it feels like reading the same book again. I can’t stand Dobby in this book. I am reading Goblet of Fire again at the moment, and so far I find him more tolerable with freedom on his side. I also really don’t care for Moaning Myrtle all that much, who in a way to me is a symbol of the school rivalry as well. Only she just can’t grow up and move on from it. Snape is different, only I’ll save that comment for later.